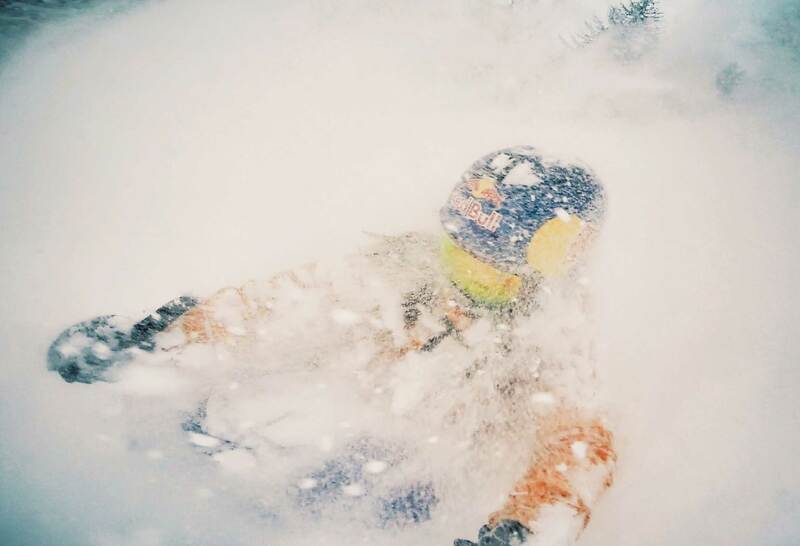 The Californian skier who recently joined the crows is a colourful character. 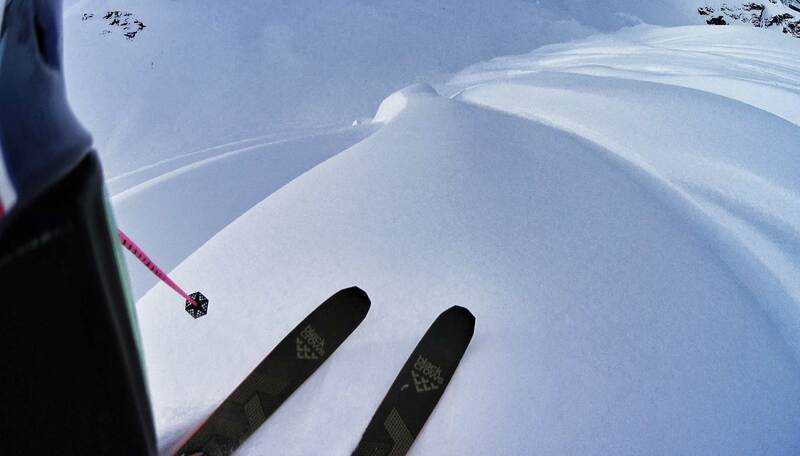 We took advantage of her spring downtime to ask her a few questions about skiing, her passions and life in general. 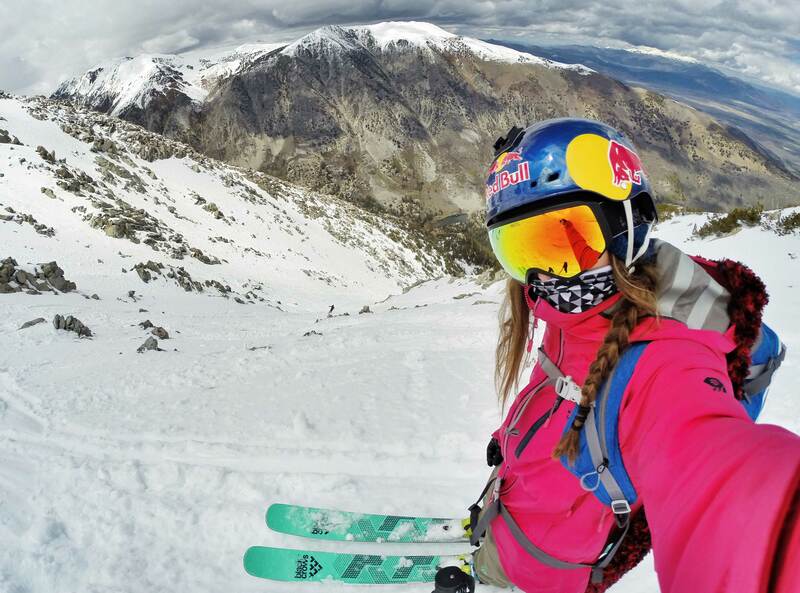 Michelle Parker is a name which sparkles in the skiing world. Filming with Matchstick Productions (MSP), producers of legendary ski films since time began, this fiery skier has become one of the North American production company’s most emblematic athletes. With black crows building its nest on the other side of the Atlantic, the arrival of Michelle as an ambassador is what one might call a fortuitous convergence. 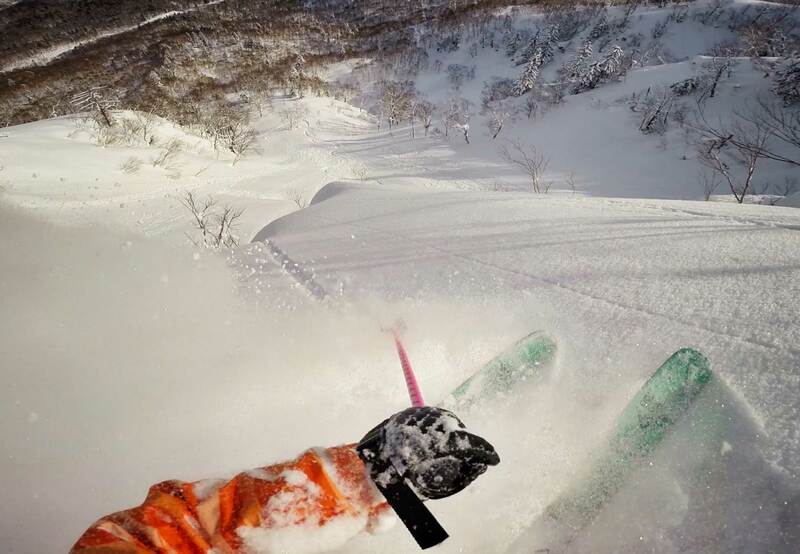 But aside from the poetic marketing speak, the crows are above all thrilled to now be flying with a great skier who lives for her passions of shredding and living life to the max. Black crows : How did you get the nickname black panther ? Michelle : My car is black and my favorite animal is the panther. I was on a trip with Chris Benchetler and Eric Pollard years ago when I got that name. We chose our radio call names based on the colour of your car and your favorite animal. There is a large group of monkeys here in Tahoe that have radio call names as well. It’s fun and it certainly took off when Red Bull and MSP produced an edit called the Black Panther. Black crows : Now you ski for black crows, do you see any analogy between the two ? Michelle : Ha! Panthers are stealthy animals. Fast and curious. 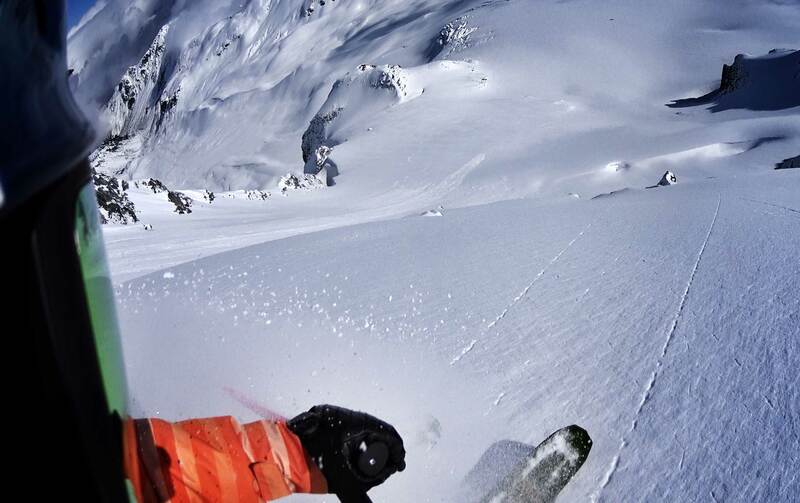 I feel that on my skis as they are an extension of my body. It’s fitting that I am on black crows and these skis are ridiculously fun and amazing. I am incredibly happy with their panther-like technology and stealth in the mountains. Black crows : Which are your favorite models ? Michelle : I love the Atris Birdie. That is my favorite ski in the world! It’s the first time that I ever clicked into a female specific ski and actually felt like they did the trick. It’s lighter weight than the men’s Atris, but still charges and feels solid under the foot, unlike a lot of women’s specific skis. 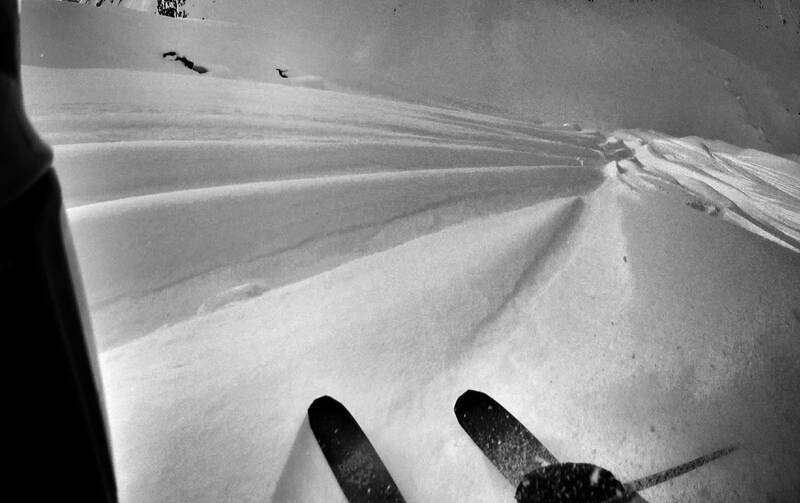 This is the go-to ski in my quiver. If I was going to travel around the world not knowing what the conditions would be, I would take the Atris Birdie for sure. I also used the Anima while I was in Alaska. I felt like I wanted a bigger ski for that terrain and I was really happy with the Animas performance. It’s rock solid, still playful, but absolutely rips. It’s a ski that I trust in variable conditions and since they’ve made it slightly lighter weight, I rocked the 182 and was fired up! Black crows : How was last season for you? 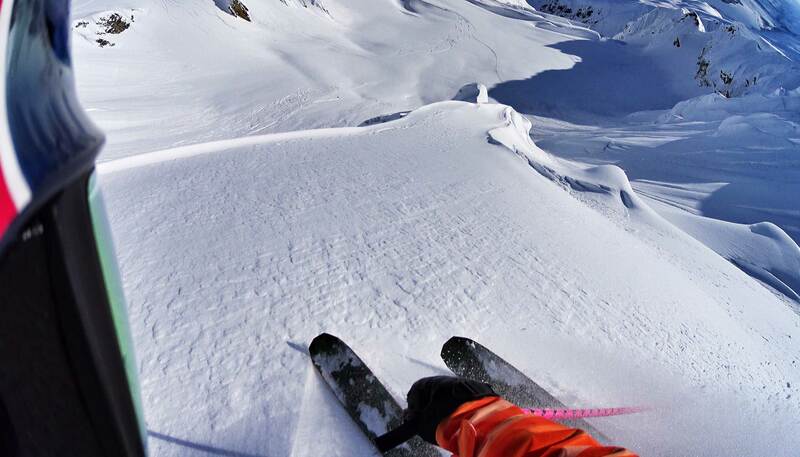 Michelle : With the lack of snow in North America last year, the winter was off at a slow start in search for powder. I spent some time at Golden Alpine Holidays with MSP where it warmed up just after our arrival. The snow wasn’t good enough to film in, but we hiked around a ton. I left there feeling stronger than ever. I then traveled to Japan where I had such an amazing time exploring the country on both the main island and the North Island. 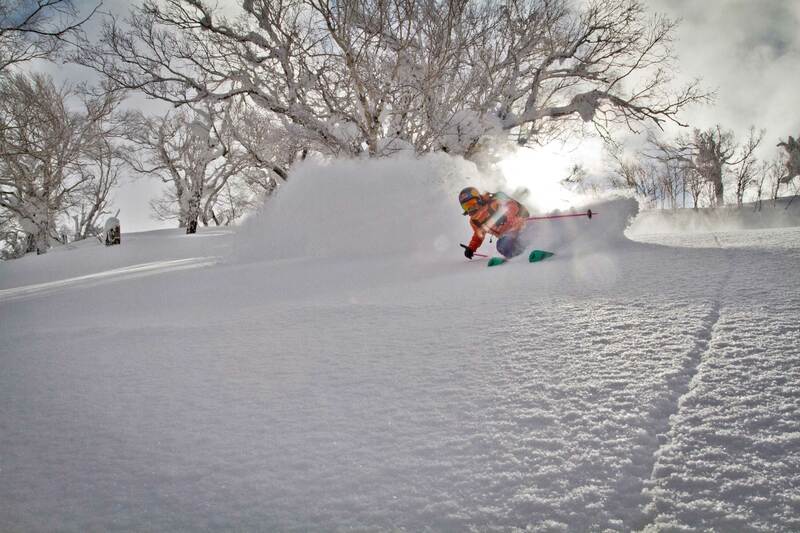 We definitely found powder! From Japan I came home for a week to Tahoe and headed up to Alaska after that. It was full on up there. Going from skiing really mellow terrain to Alaska was intimidating. With some days under my belt in those mountains and on that terrain, I started to feel more and more confident and comfortable which was amazing as I’ve been there twice before and had never felt that. So the season ended on a high note. Black crows : A specific memory that comes to mind from last winter ? Michelle : I was fortunate enough to get to spend time in the mountains with a couple of other ladies – Tatum Monod and Lexi Dupont. Skiing with women in terrain like that was really eye opening to me. It gave me a new sense of confidence and it was ridiculously fun. The attitude, positivity, stoke, and lightheartedness was contagious amongst our crew. A really special moment. Black crows : And then you put your skis away ? Michelle : No, I went on a trip to Ecuador to climb and ski Cotopaxi with a large group of friends from Tahoe. Adrian Ballinger, owner of Alpenglow Expeditions, invited me to join himself and a group of friends, athletes and clients. Mountaineering is a new realm of skiing that I am just getting into and this will be my first high altitude peak. I was looking forward to figuring it out with friends and seeing how my body coped with the altitude. In the run up to the trip, I had to get in really good shape and make sure I was feeling strong. Black crows : How did it go ? Michelle : Ecuador was absolutely amazing. Such a unique and cool experience to be a part of. It was my first time attempting to climb and ski high altitude peaks. You never know how your body is going to react at altitude, but I felt great. We went through the craziest weather that I have ever experienced on a mountain with rain, snow, and really intense wind. So intense that we were literally crawling on all fours to make it to the top of Cotopaxi. 300 feet shy of the summit we decided to turn around due to the high winds and go down. Skis still on our back, covered in an inch of rime ice, we walked down this massive volcano making no turns, but with huge smiles regardless. It was truly a great experience, a learning experience, and a great stepping stone in my skiing to take me to different places and mountains around the world. We did however get to make some turns on Cayambe the previous morning. After being shut down by white out conditions and high winds, myself and my good friend Jim Morrison clicked into our skis and had the best time ever skiing from 17,000 ft.
Black crows : What’s it like for you at home? Michelle : I love being home! Squaw Valley ultimately raised me with my family being based there. I now live in Tahoe City with a close group of friends at my house. The sense of community and love that I feel when I am home is like no other. I feel really lucky to have grown up in such a beautiful location with endless mountains to play on in every season. Skiing, climbing and biking occupy most of my time while I am here in Lake Tahoe and I never get bored. California is a sunny place and I feel as though I certainly take advantage of that! Black crows : What kind of person are you? More relaxed or active ? Michelle : I can’t sit still very long. I’m a ‘yes’ person and tend to overcommit myself at times. I’m not really into relaxing as I like to be moving and doing fun activities as much as possible. I live about a block away from a trail system which is great for mountain biking and trail running. There are two sweet doggies living at my house as well. They don’t belong to me, but I treat them as though they are mine when I am home. I love running and biking with them! My three room mates are also very active and my closest friends. It’s great to come home to such a tight knit group of friends that are always fired up to be outside getting after it. Black crows : What do you get up to during the summer months ? Michelle : I still travel quite a bit in the summer for different events and I head South to SASS Global Travel to coach at a summer camp in Argentina for about a month every August. My summers are packed full of adventures trying to get as much sun as possible climbing or biking. I also spend a lot of time with my family here. Family is very important to me and I feel lucky to have such a supportive one. It’s a blast to go on hikes with my mom and golf with my dad. I love to cook, visit the farmers market and go to places in and around Tahoe that I haven’t yet been. There’s lots to explore here! Black crows : Is skiing a family thing ? Michelle : My mom and dad are two of the most passionate skiers. My mom in particular skis nearly every day. On her lunch break she heads to the hill to get at least one run in. She truly loves it and it’s really fun to go out with my family. My dad is a ripping skier, but I have to watch out sometimes because he’ll always try to keep up with me. He’s fast and just got two new knees so hopefully this upcoming season I’ll have a lot more days on the hill with my dad. Skiing is a common thread for my brother and I. I have had some of the most memorable runs with him. Black crows : What kind of a skier were you when you were young ? Michelle : I grew up racing here in Squaw Valley. When I was 15 I started to compete in slope style and half pipe contests which is ultimately how I broke into the ski industry. Growing up I just loved to be outside in the mountains. Squaw was such an incredible place to grow up surrounded by world class skiers, chasing them around the mountain. I spent a lot of time skiing. Racing taught me the technical skills and then I took it from there. Black crows : How did it strike you that you could dedicate your life to skiing ? Michelle : I was skiing one day and a guy came up to me and handed me a business card. Jason Leventhal, then owner and founder of Line skis. He was my first real sponsor and talked me into competing in my first slope style competition. That was the US Open when I was 16. It all started to take off from there and I just stuck with it because it was the most fun thing in the world. It still is, without a doubt. Black crows : And how did you make it work ? Michelle : I just kept at it. My love for skiing has grown tremendously since day one. I am constantly finding new challenges and objectives. There is so much in the world to explore on your skis and I am lucky to have been able to call skiing my job for the past 12 years. Positivity and just purely enjoying the sport is what has kept me in it. Black crows : Can you concentrate exclusively on skiing or do you have other jobs ? 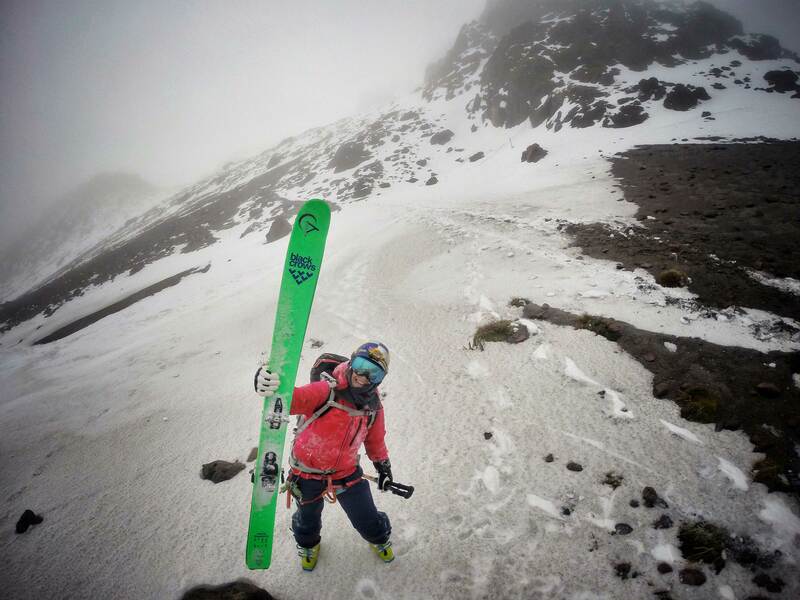 Michelle : Skiing is my only job, but that job extends into many different aspects of my life. It’s a full time job year round, so yes I concentrate exclusively on skiing. Black crows : As a person living close to nature, do you aspire to protect it ? Michelle : I am actively calling the state senators and officials asking them to put a price on carbon and supporting clean energy. I think this is the most effective way. I live very consciously here in Tahoe and when I travel and I try to conserve, not consume, and be aware of my actions. I know that I travel a lot so often I’ll purchase carbon credits and support green initiatives. I use my voice with friends and fans alike. Black crows : When you are shooting videos, how do you choose and prepare your line ? Michelle : Whatever looks like the most fun really. I start at the bottom and go up from there. How is the run out? Is it exposed? What are your exits? Then take a photo, go to the top, orient myself, and take it from there. 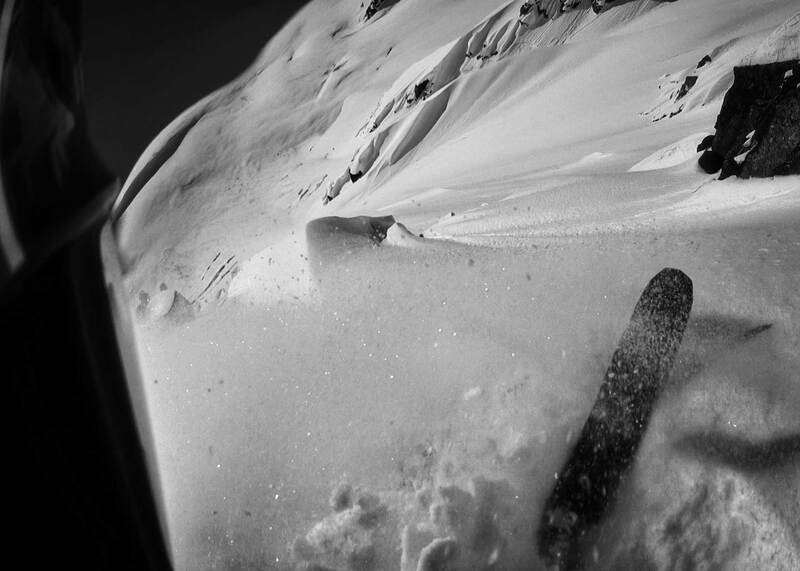 Black crows : How would you define your type of skiing ? Michelle : I like to ski fast. I love hitting cliffs and being playful too. Black crows : Do you feel you are progressing in your skiing ? Michelle : Yes, every year I gain experience and learn from the mountains and individuals that I surround myself with. I am in a constant state of progression when I spend time in the mountains and I love that feeling. It’s spectacular to end a day and to feel a sense of satisfaction. 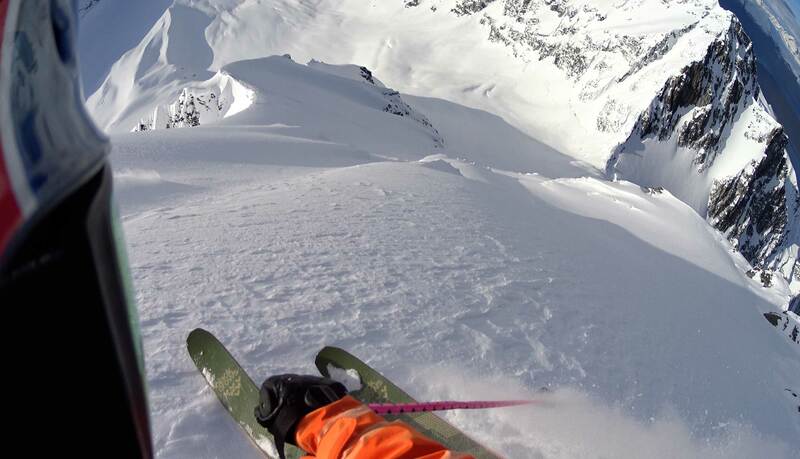 Black crows : What does skiing mean to you ? Michelle : Skiing is my biggest passion. It makes me excited, happy, and free. It’s an activity that allows me to be completely in the moment and it is where I feel the most focussed in my life. It’s like an active meditation. Skiing is the most fun thing that I could possibly think of doing at any point in time. It brought me to incredible places and has shaped how I live my life. The mountains and people that I have met through skiing have had a profound impact on who I am. Black crows : With the internet, webisodes and POV skiing videos have moved into new realms, what’s your opinion on the evolution of ski videos ? 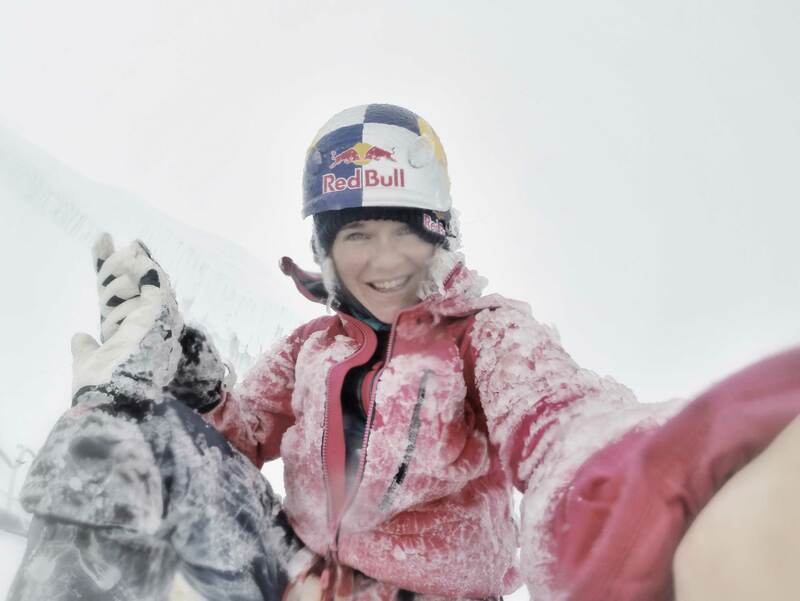 Michelle : I think that it is really important to take your time in the mountains. People are so caught up in producing webisodes and creating video parts for the internet…I feel as though things are moving too quickly at times to produce. I think it’s very crucial and important to do things slow and take your time while dealing with the snowpack and bigger mountains. I also think that a lot of good has come from POV and the internet, but I also am a big fan of producing a ski movie at the end of the year. Watching an edit on your phone is nothing like going to a movie premier, meeting athletes, and watching it on the big screen. Black crows : Do you ever switch places and film or photograph others ? Michelle : I love photography so I am always shooting other athletes while we are out filming. I love to throw photos up of everyone in the mountains having a good time so there’s that as well. Filming is creative and I enjoy it, but I don’t have the editing side down. Black crows : Did you go to college and do you have any other passions outside of skiing ? Michelle : I love to learn. I’ve taken quite a few college courses, never for the papers, but for the knowledge. I love to read and I love to learn. Humility is one of the greatest characteristics in a human, I think. So learning from those around you, the mountains, and from reading or school is very much a passion of mine. Black crows : Do you know what you would like to do after your professional career ? Michelle : I think about it all the time and it’s exciting. I could do anything! I love skiing so much and the industry has helped make me become the person that I am today so sticking in the industry in some way or another would be great, but there is so much in life that I am interested in and my passions are growing and morphing all of the time. It’s an exciting thought.